Discover the concept of cat intelligence. 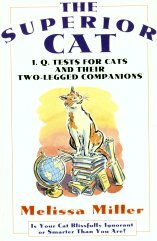 You and your cat can take the IQ tests in this book. This tongue-in-cheek volume also looks at other factors affecting intelligence and behavior - upbringing, sensitivity, etc. As the cover says "Is your cat blissfully ignorant or smarter than you are". Previously owned but in good condition. Copyright 1993, 178 pages.